Jockey Dwayne Dunn hopes debut Caulfield winner Brutal can bring his form to Moonee Valley. Exciting three-year-old Brutal puts his spring credentials on the line in the McKenzie Stakes at Moonee Valley. In previous years the McKenzie Stakes (1200m) has been a race to shape the spring and Saturday’s race is no different. Previous winners include Bel Esprit, Danerich, Light Fantastic, Anacheeva, Rich Enuff and Overshare. Of the 10 remaining runners on Saturday, five are last-start winners, four being unbeaten. Brutal lived up to his name on debut at Caulfield last month and is odds-on favourite to repeat the dose. Both co-trainer Wayne Hawkes and jockey Dwayne Dunn have declared everything is on song for Brutal on Saturday. 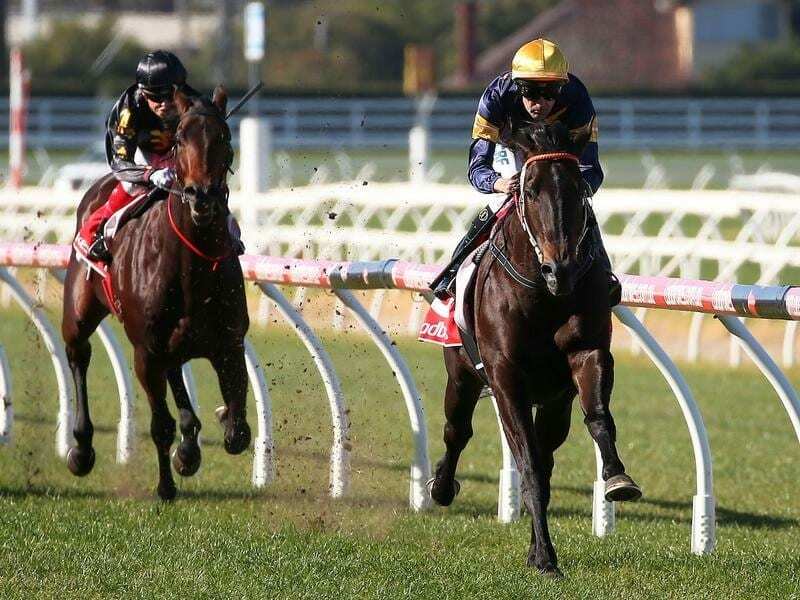 His performance will determine whether Brutal is stepped up in distance for the Caulfield Guineas for which he’s the $11 favourite, or remains a sprinter. “We’ll let the horse do the talking and he can tell you on Saturday,” Hawkes said. Dunn has confidence saying Brutal has grown and developed in the five weeks since his Caulfield win. “If you look at him in the yard on Saturday he’s gone from a boy to a man,” Dunn said. “If he brings to the races what he did at Caulfield he’s going to be mighty hard to beat. “It would be nice to see him step well as it’s his first time at the Valley and to be near the lead and near the rail so he knows where he’s going,” Dunn said. Dunn hopes Brutal will be adaptable as his racing career develops, but if he proves to be a front runner then he’ll work with him. “Team Hawkes likes them to race up on speed and you take away a lot of variables up the front,” Dunn said.